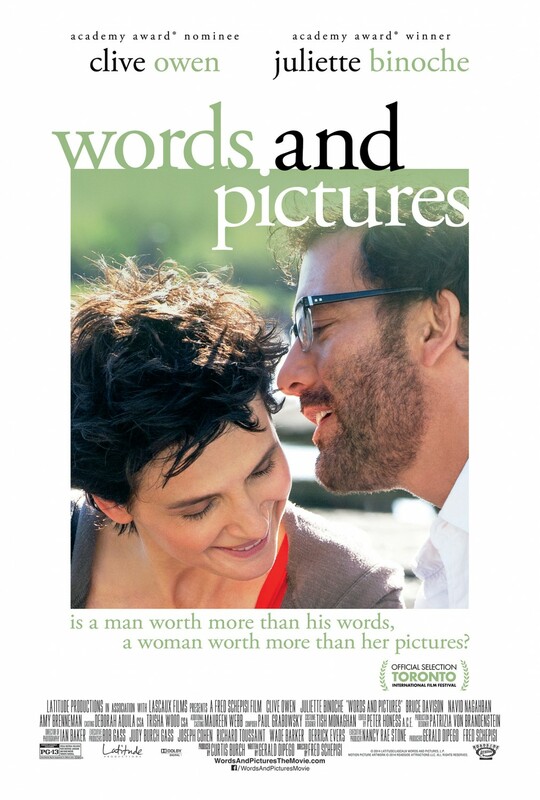 Yes, Words and Pictures includes many of the clichés that typically populate both romance films and movies in which the lead characters are teachers, however such clichés do not necessarily render a film ineffective if the broader context of the story allows us to look beyond the obvious and appreciate what else is going on. In that regard, veteran Australian director Fred Schepisi has done a really good job in crafting a film that has many easily identifiable genre conventions, yet still has plenty to say on all manner of subject matter, including art, language, technology and the purpose of education. With accomplished performers such as Clive Owen and Juliette Binoche in the lead roles, this is a film that defies its rom-com leanings and becomes something much more intelligent. The narrative trajectory of the characters is most definitely predictable, but because we already know what is going to happen on that front, we can focus on other elements of the story, including questions raised about the value of words and images and notions of what defines a good teacher. 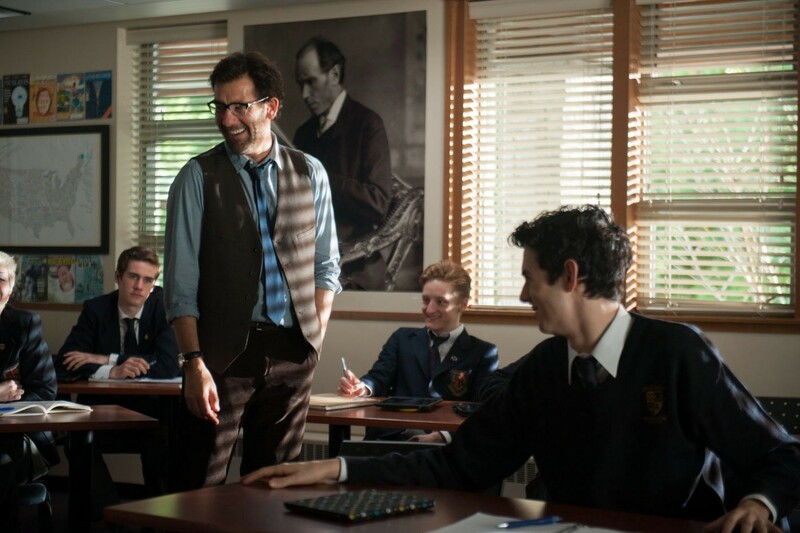 Shot in Vancouver but set in a New England prep school, Words and Pictures is the story of two teachers with oppositional personalities and approaches to teaching who engage in a battle of wits that, inevitably, leads to romance. Binoche is new-teacher-in-town Dina Delsanto, an acclaimed artist battling rheumatoid arthritis, while Owen’s Jack Marcus is the popular (with the students at least) English teacher with a drinking problem and a passion for language. Whilst the two present as polar opposites with regard to their teaching styles, they both have very high expectations of their students. Dina refuses to accept that a work of art being deemed “ very good” by the masses is a satisfactory achievement and she demands that her students aim higher than that, particularly the talented Emily (Valerie Tian). Jack, meanwhile, is less interested in allocating formal grades than he is in inspiring students to use language in intelligent and creative ways to understand and appreciate the power and influence of words. The problem for Jack is that the school is losing patience with his unorthodox approach and his job is under threat; drunken run-ins around town doing little to curry favour with the school administration. Of course, the school board are more interested in image and reputation than they are student outcomes, so Jack sets out to convince the powers-that-be of his “worth” to the school, a value that has little to do with his ability as a teacher and more to do with restoring his tarnished reputation as a writer of some repute. Needless to say, Jack finds himself drawn to the reclusive Dina, who is struggling to come to terms with the impact her illness is having on her ability to paint. Whilst the two central characters are typical of all screen teachers – from Gabe Kotter to Erin Gruwell – in that they apparently only have one class, there is some honesty in the way they and the other teachers (which include Bruce Davison as Walt, Jack’s only ally) are presented. The film explores what constitutes a good teacher: Does it matter if Jack is an alcoholic? Is being a nice person a requirement for being a good teacher? Does being a popular teacher make you any more, or less, effective in the classroom? Words and Pictures also serves as a celebration of both the visual and language arts and explores the influence of technology on young people, with Jack’s witty and impassioned rants bemoaning social media proving particularly amusing. Owen embodies Jack as a blowhard fighting a losing battle against both the system and his own self-loathing, while Dina has little desire to ingratiate herself with her students or other faculty members. The chemistry between Owen and Binoche is terrific and, despite the somewhat cantankerous personalities of their characters, these are two teachers that any school would be lucky to have. With several subplots thrown into the mix, such as Jack’s strained relationship with his son Tony (Christian Scheider, son of Roy, in his screen debut) and the cruel harassment directed at Emily by a boorish male student, there is enough going on to make Words and Pictures a cut above the warm and fuzzy fluff that saturates so many romance narratives. Yes, of course it ends pretty much how we expect, but with good performances and characters that are multi-layered, Schepisi has managed to create a genre piece that, unlike so many others, is both entertaining and intelligent. Previous Previous post: Educational Triage?